The costs for leased homes in Sri Lanka is more tightly restricted in instances where the residence is governed by the Rent Act. Section 4 of the Rent Act dictates the “standard rent,” or base rent, that can be charged by landlords. Section 5 details permissible increases that may be added to the standard rent, resulting in what is known as the “authorized rent.” The authorized rent amount is a legally binding cap on what landlords can charge their tenants. It is considered a crime to demand, charge, or receive any payment in excess of the authorized rent amount. These restrictions, however, do not apply to properties that are exempt from the Rent Act. When land available for lease or tenancy is not controlled by the Rent Act, the security deposit may be openly negotiated between the landlord and the tenant. There are no restrictions regarding the security deposits on these properties. If land is controlled by the Rent Act, the security deposit on the residence may not exceed three months. The tenant may not be charged any additional fees on top of this security deposit. In negotiating a tenancy or rental contract, it is beneficial to consider the following subjects. Discussing fees and responsibilities for the residence will be beneficial for all involved. * which party is responsible for payment of fees, taxes, etc. Generally, Sri Lankan landlords will require rent to be paid monthly, whether or not the land is governed by the Rent Act. As a general rule, termination or eviction notices must be given at least one month in advance. Remember that landlords retain the right to lease their accommodations to the tenants of their choosing. The landlord may set the rental price of his choosing. 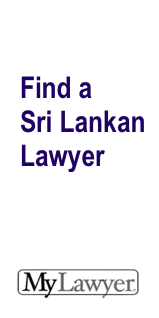 Beyond this, Sri Lankan rental law generally favors the tenant. Most costs are negotiable, and both parties may negotiate accordingly.